Photo by A. Gillardi Photo. Photo by Kevin J. Miyazaki. More than 15,000 patrons attend this annual three-day event on Mother’s Day weekend, featuring local food vendors, live music and 150 juried artists from across the country exhibiting work in ten media categories: ceramics, fiber/textiles, glass, jewelry, mixed media 2D, painting, photography/digital, printmaking/drawing, sculpture and wood. 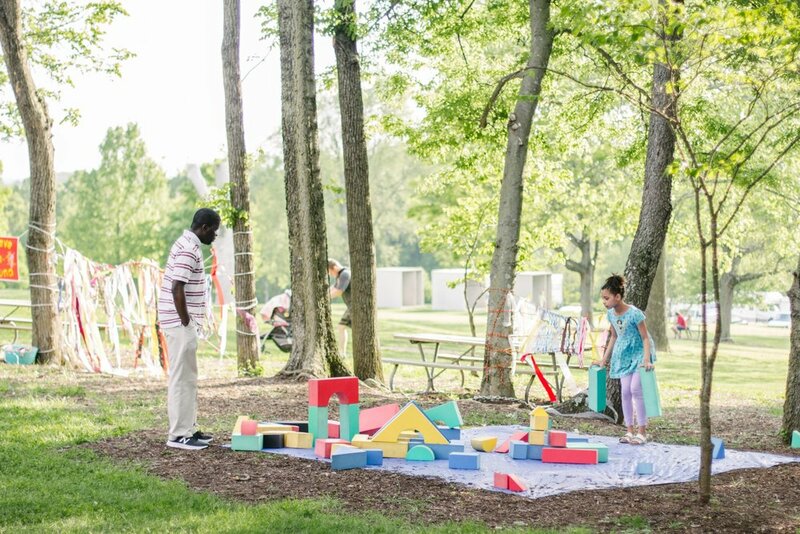 Laumeier Sculpture Park is one of the first and largest dedicated sculpture parks in the country, and is an internationally recognized, nonprofit arts organization accredited by the American Alliance of Museums and operates in partnership with St. Louis County Parks. 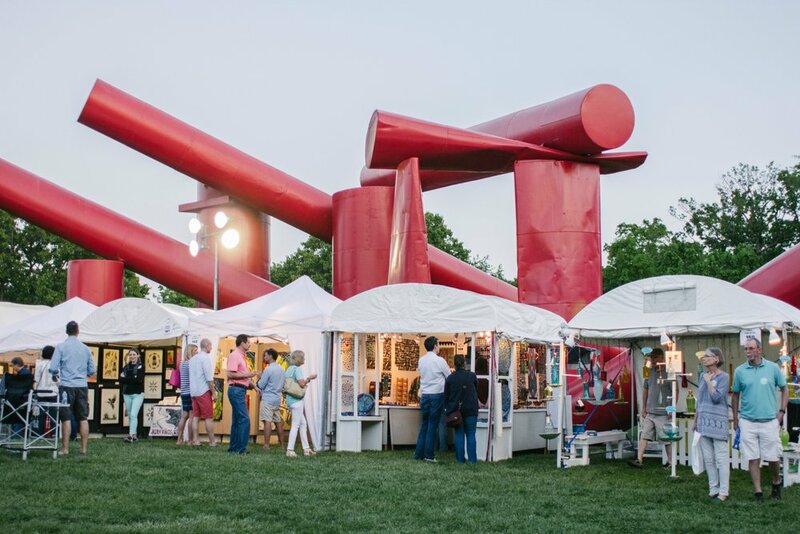 Laumeier presents 60+ works of large-scale outdoor sculpture in a 105-acre park located in St. Louis County. Free and open daily, the Park serves 300,000 visitors of all ages each year through sculpture conservation, education programs, temporary exhibitions and public events. Friday, May 10 / 6:00–10:00 p.m.
Saturday, May 11 / 10:00 a.m.–8:00 p.m.
Sunday, May 12 / 10:00 a.m.–5:00 p.m.
All artists ages 18 and up who exhibit work of original concept, design and execution are eligible to apply. Artists may apply in more than one category; however, a separate application and jury fee must be submitted for each category. Artists may not apply more than once in the same category. Total event participation is limited to 150 artists. Laumeier uses ZAPP for its Annual Art Fair digital application process. Judges award a total of $5,000 in cash and prizes to those artists achieving excellence, regardless of media category. 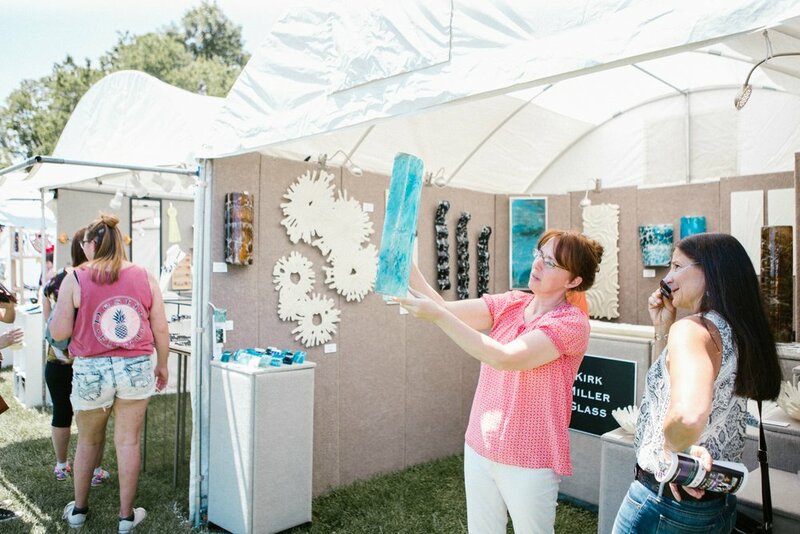 Artists are juried by a panel of respected fine art and craft professionals, selected by Laumeier Sculpture Park from local and regional museums, universities and galleries. All applicants are juried anonymously. Each applicant's images are viewed individually in order from 1 to 5, viewing the booth image last. After viewing the individual images, jurors view all five images on their monitor while scoring the applications from 1 (low) to 10 (high). All scores are combined and averaged, and the top 33% of applications move onto the second round. The second-round scores are tabulated to select the top applicants in each category for invitation to participate. Consideration to balance of media categories is given to select the number of artists in each category. Scoring is based on originality, creativity, design, technique, craftsmanship and presentation. ZAPP uses sRGB color space. All monitors will be correctly set to ensure color, contrast and value of images for jury. The process and dimensions will be displayed on the jurors' monitor when selected. The description of materials and techniques will be displayed on the jurors' monitor when scoring. A waitlist of alternates in each category will be created from the scores immediately following the invited applicants. Waitlisted artists will be contacted in order beginning Thursday, March 14, through Friday, May 10, 2019. Decisions of the jury panel are final. No jury comments are available for feedback. Laumeier Sculpture Park reserves the right to enforce these restrictions at the time of the Art Fair and will require removal of any work in violation of the policy. If this is deemed necessary, the booth fee will NOT be returned. All work must be handmade originals in all media. Work done by a production studio is NOT acceptable. No work will be exhibited which has been made with the use of commercial kits, molds, patterns, plans, stencils or prefabricated forms. Only original prints are permitted; all original prints must be properly signed and numbered. Photographers must print their own photographs, or be involved in and supervise the printing process. Photographs printed on stretched canvas must be individually labeled "photograph on canvas." All flat, hanging work must be suitably framed (if applicable). Portfolios are permitted for matted work. Artists must be present with and exhibit their work during ALL hours of the Art Fair. Identification will be checked. Laumeier reserves the right to refuse exhibition of work that is not consistent with the submitted images and rules listed above. Failure to comply will result in immediate removal from the Art Fair with NO refund. Artists may NOT bring pets or sound equipment to the Art Fair. Artists may choose between an open booth for $350 and a tented booth for $500. All exhibit spaces measure 10 x 10 feet. Due to space limitations, double booths are not available. Artists must provide all display materials, backdrops, scaffolding, tables and chairs. Open and tented corner booths are available for an additional $100 fee on a first-come, first-served basis. Corner booths imply two open walls (not necessarily on the corner of the fair set-up). Artists must provide their own white tent/canopy. All booth spaces are located on the grass; completely flat ground not guaranteed. There are a limited number of tented booths available on a first-booth-payment basis. Tented booths are located under large (80 x 100 feet) white tents, with ample room for a standard 10 x 10 feet canopy underneath. Three (3) feet of shared storage space is available behind each booth. No side walls are provided. All booth spaces are located on the grass; completely flat ground not guaranteed. 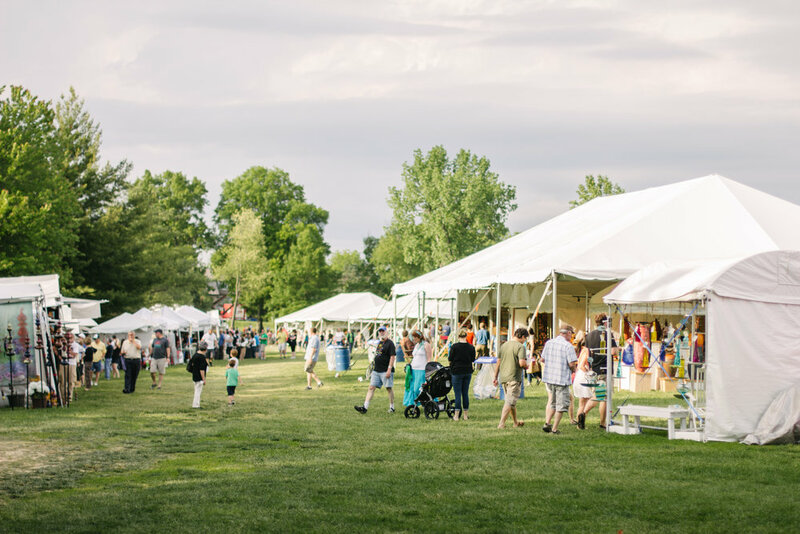 An electrical hook-up is provided for all open and tented booths, with 300 watts being the maximum power available (the equivalent of three 100-watt bulbs). Artists must supply their own lights and 12-gauge (or thicker) heavy-duty (outdoor-rated) electrical cords (up to 50 feet recommended). Laumeier reserves the right to limit the amount of electrical equipment used by each artist in order to assure the availability of electricity for all participants. Note that the opening evening of the event runs past sunset; Laumeier provides lighting for the safety of patrons, but artists are encouraged to light their individual displays. Electricity for booths will be available beginning at 3:00 p.m. on Friday, May 10, 2019. Artist parking is located at the Mercy Office Complex at the corner of Geyer and Rott Roads, adjacent to the Park's Main Entrance (within walking distance). Artists should park at the back of the parking lot, in the designated Artist Parking area, with an Artist Parking Pass visible in the vehicle window at all times. Artist Parking is not available during Artist Set-Up times. Artist Parking will be available beginning at 4:30 p.m. on Friday, May 10, 2019. No shuttle provided. No overnight parking. On-site ADA-accessible parking is available for those with the appropriate plates or placards. Please contact Laumeier if any additional accommodations are needed. Artists receive all proceeds from Art Fair sales. Artists are responsible for filing Form 2643S Missouri Special Events Application with the Missouri Department of Revenue and for collecting and filing Missouri sales tax. In addition, the City of Sunset Hills requires a business license for participation ($25 fee in 2018). Artists should not ship their work to Laumeier in advance of their arrival. Laumeier does not have the capacity to store work safely. Artists must bring their work with them or ship it to their hotel. Artists grant Laumeier Sculpture Park and its representatives permission to take and use photos and videos of all artist logos, signage, booths, employees and patrons for use in news releases and promotional materials, including (but not limited to) printed and electronic publications, websites or other electronic communications including names and identities in descriptive text or commentary in connection with the images. Artists authorize the use of these images without compensation to the artist and acknowledge that all negatives, prints and digital reproductions shall be the property of Laumeier Sculpture Park. Laumeier Sculpture Park assumes no liability for loss or damage to any property of the artists due to fire, tornado, weather conditions, vandalism, theft or other causes. Laumeier shall not be responsible for any breach of the law by artists or their employees or contractors. Artists agree not to bring any suit for damages against Laumeier Sculpture Park for any personal injuries or property damages which may occur to the artists or their employees or contractors.